The Khmer empire was the most powerful in South East Asia between the 10th and 13th centuries. Temples remained hidden in the jungle for hundreds of years until their rediscovery in the 19th century. Though not as big as Angkor Wat in Cambodia, the Khmer ruins in Thailand are still amazing. Off the beaten path and away from the tourists they offer a look into the splendour of ten centuries ago. The flight from Bangkok to the 13th century capital of Sukhothai takes a little over an hour. We stay in the walls of the Old City and from our guesthouse Thai Thai Sukhothai it is a ten-minute walk to the ruins. We hire bicycles from the guesthouse for 50 Baht a day. Bicycle hire shops are on just about every street corner and there’s one in front of the main entrance gate. Motorbike hire is 200 Baht a day or a tuk-tuk tour which will take you on a four-five hour excursion through the ruins for 500 Baht. Over 100 sites are spread in and around the ancient walls in a five-kilometre radius. The complex is divided into three zones – central, northern and western. The ruins in the western zone are mainly dilapidated, except for Wat Saphan Hin, a large Buddha statue on a hill and a few smaller ones. Each zone has a separate entrance fee of 100 Baht and 10 Baht for taking a bicycle in. 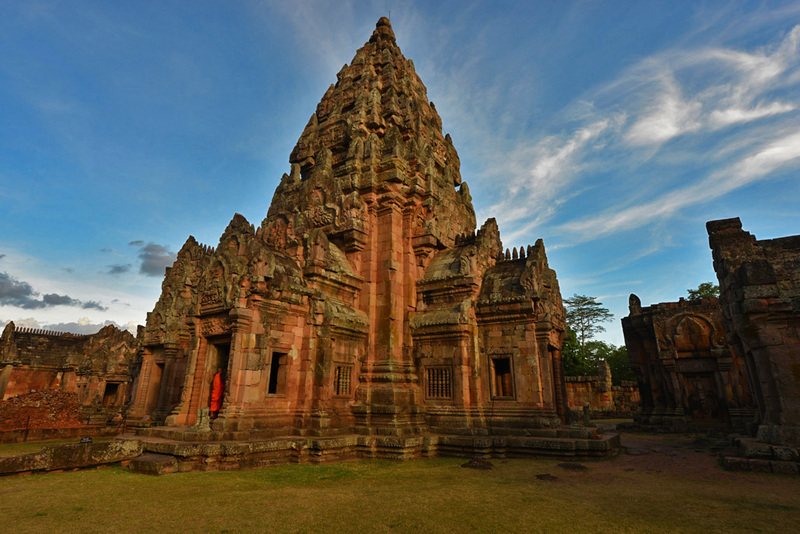 Dominating the surrounding temples in the central zone is Wat Mahathat. The large stone Buddhas, pillars and structures give an insight into the first capital of Siam and it takes our breath away. At sunset, the temple reflects and silhouettes an orange glow in the pond in front of it. On Saturday nights it’s a beautiful sight when the locals light up the temple with lanterns and candles. In the mornings it opens at 6 am, so this creates a great opportunity to have the place to yourself. 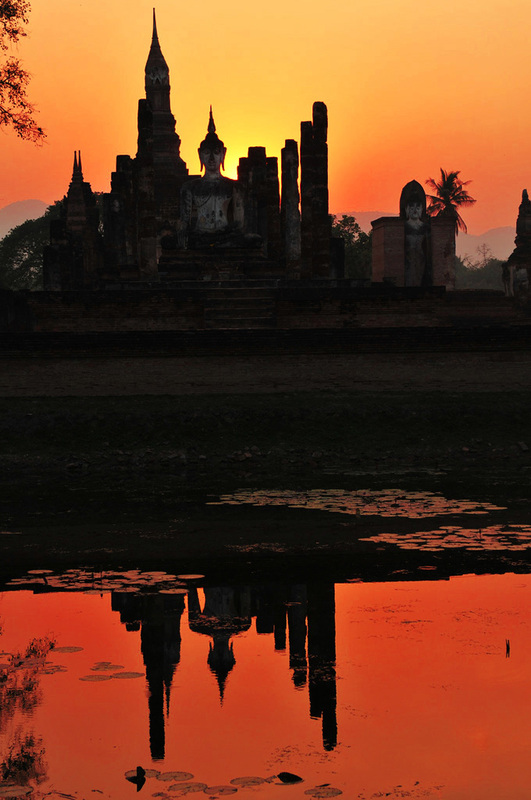 In the northern zone stands the most photographed temple in Sukhothai – Wat Si Chum. The famous giant seated Buddha peers out of four enclosed walls. The sight of this is impressive today, so nearly 800 years ago, in its prime and surrounded by a moat, it would have been even more spectacular. On the main street that leads to the entrance to the Old City, there is a row of restaurants and guest houses opposite Wat Mahathat. We really like the simple open-air touristy restaurants as they are inexpensive and have plenty of choice including vegetarian. We take the 1st class bus to Ayutthaya for 360 Baht. The bus station is on the main street near the 7-Eleven. It takes five hours and stops for lunch along the way. Wat Mahathat in Ayutthaya is the most imposing of them all. Ayutthaya was the next capital after Sukhothai. The medieval city tucked in the jungle was always under threat of attack by the Burmese who finally conquered the city in 1767. It was the greatest disaster in Thai history, and with the damage so great the city became uninhabitable and Bangkok became the next capital. The entire Old City, about five kilometres square, is one big archaeological site. The most imposing temple of them all is Wat Mahathat whose crumbling ruins, with rows of headless stone Buddhas, are evidence of the Burmese conquest. Ayutthaya’s icon, the giant Buddha head entwined in a tree trunk is also in this compound. We stay at Baan Tye Wang, a charming guesthouse run by a lovely couple, Dang and Od. It’s in a great location in comparison to the ruins, and bicycles are complimentary. The quaint room with the outdoor shower cost 1750 Baht a night with breakfast. Navigating the ruins is easy with the supplied map. Dang and Od can also arrange for a tuk-tuk driver to collect guests for a half day tour of the ruins for 1000 Baht. We eat at a restaurant that serves mouth-watering Thai food and the yummiest smoothies. Coffee Old City is tucked away on the street across from Wat Mahathat. We eat here for several meals during our stay. The menu is small but includes vegetarian options with meals for 70-100 Baht and beverages and desserts 45-65 Baht. 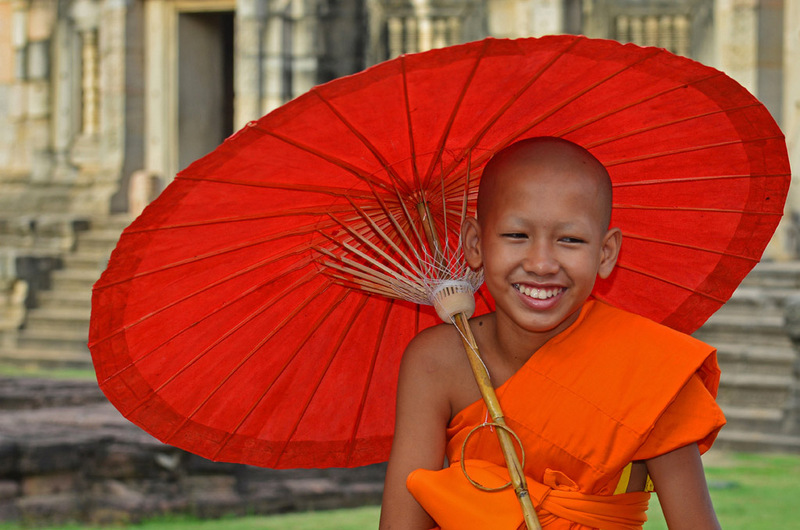 From Ayutthaya, we take the 90-minute journey by express train to Lopburi. A tuk-tuk takes us to the train station for 100 Baht. In Lopburi, the train station is in a convenient location and the ruins are just across the road. 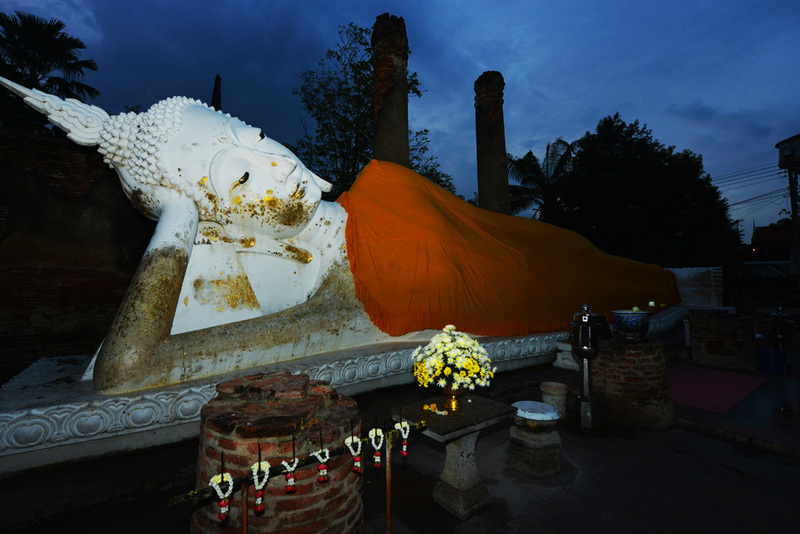 During the Ayutthaya period, Lopburi was the second capital. 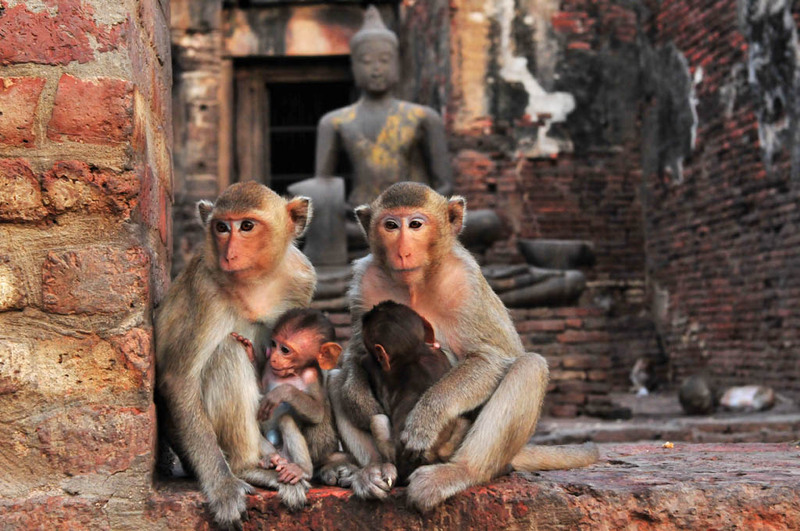 Lopburi doesn’t have extensive ruins but the temples swarm with macaque monkeys. The monkeys leave a path of destruction behind them, but locals recognise their religious symbolism and attraction to the tourists and protect them. They hold a festival and buffet feast for the monkeys every November. 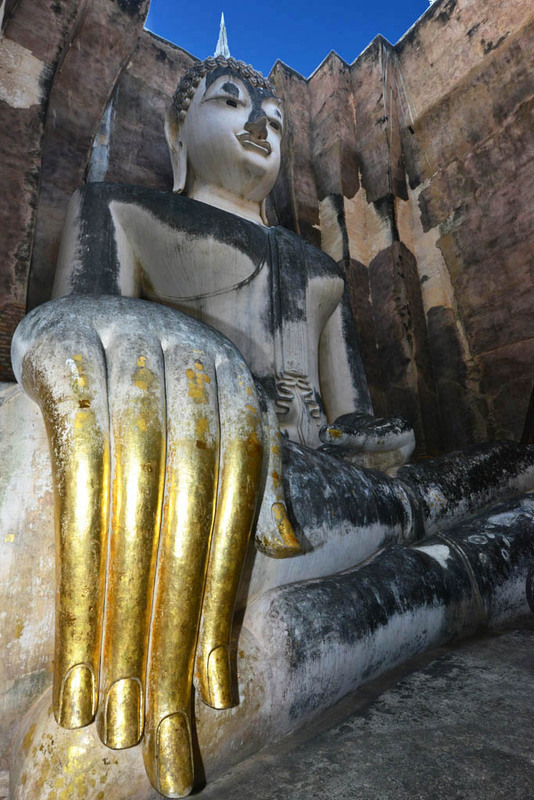 According to legend, Lopburi once belonged to Hanuman the Monkey King. 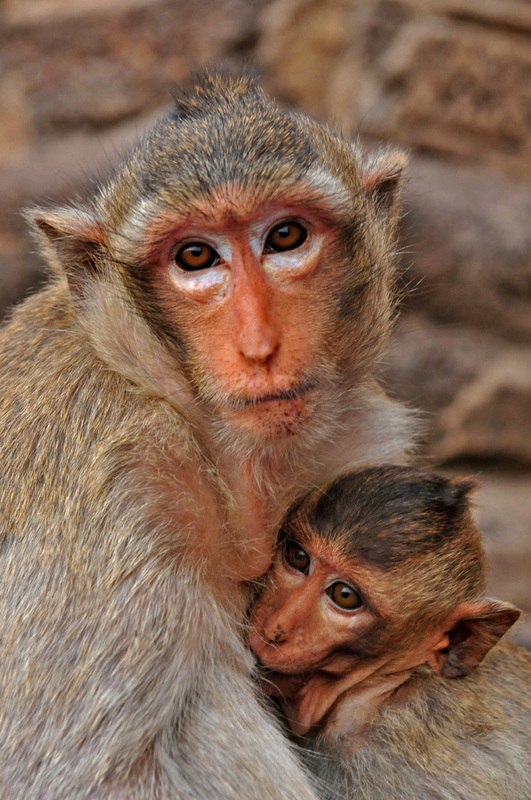 Many locals are delighted, even centuries later, that monkeys still rule the area. 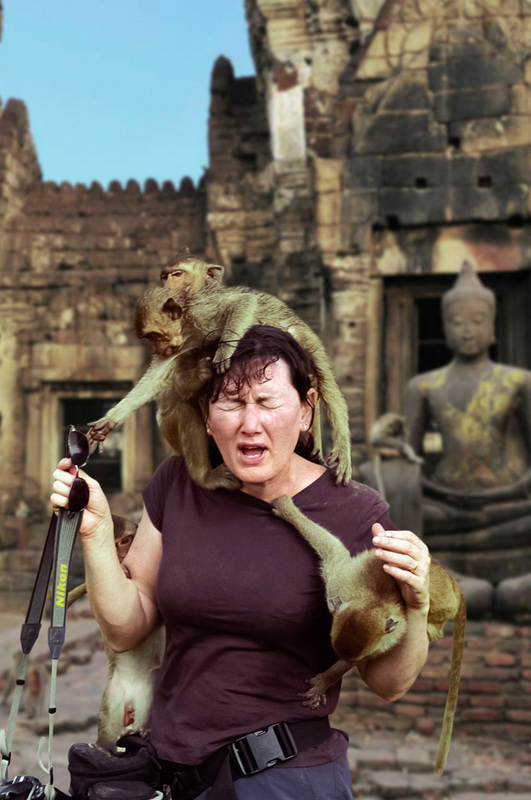 Sue and monkeys in Lopburi. They leave a path of destruction behind them. One of the three monkey clans hang out at Prang Sam Yot Temple, which has three distinctive prangs, a perfect example of Khmer architecture. The sight of the monkeys climbing and playing on the centuries-old stone Buddha is something out of an enchanted myth. Our next stop is the ancient city of Phimai. From Lopburi to Phimai it’s nearly 6 hours of travel via Ayutthaya. The only train route to Phimai, close to Lopburi is Ayutthaya to Nakhon Ratchasima (Khorat) which involves the train, tuk-tuk and local bus. The Phimai ruins are smaller than Sukhothai and Ayutthaya and one of the best-restored ruins in Thailand. The original stone wall still encloses the ruins from Phimai town. The ruins open at 6.00 am and the entry fee is 100 Baht. 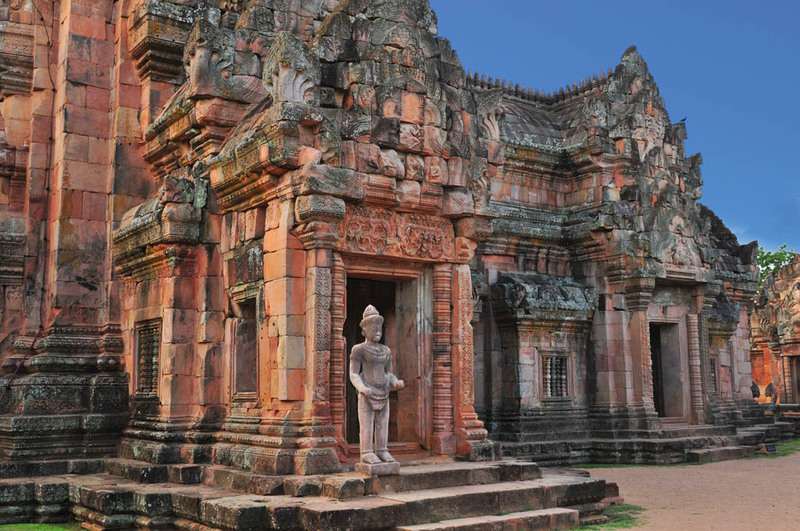 Built 100 years prior to Angkor Wat, the pink sandstone temple was the architectural model for it. It faces towards Angkor which is about 400 kilometres away and is the last temple on the imperial road before Cambodia. The ancient highway can still be traced from the gate towards Angkor. We stay at Moon River Homestay in a basic timber bungalow with private terrace, air con, fridge, warm shower and WiFi. With a simple breakfast, it is 700 Baht a night. It is only a ten-minute walk to the ruins and the centre of town. Phimai is a typical Thai town so there is not much tourism, and little English is spoken. It has a few basic local restaurants but not a lot of choices. 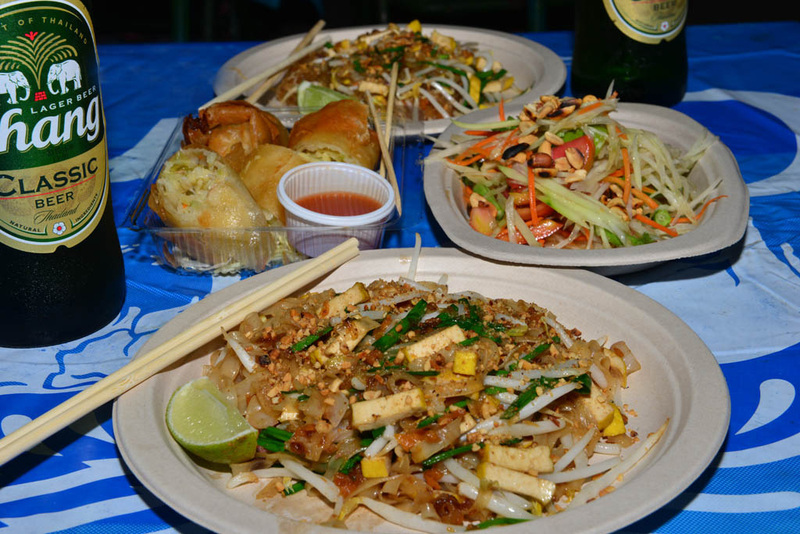 We find vegetarian spring rolls at the night markets and they make a special vegetarian pad thai for us. The freshly cooked spring rolls have homemade peanut and sweet chilli sauce – scrumptious! The vegetarian pad thai and spring rolls are scrumptious! 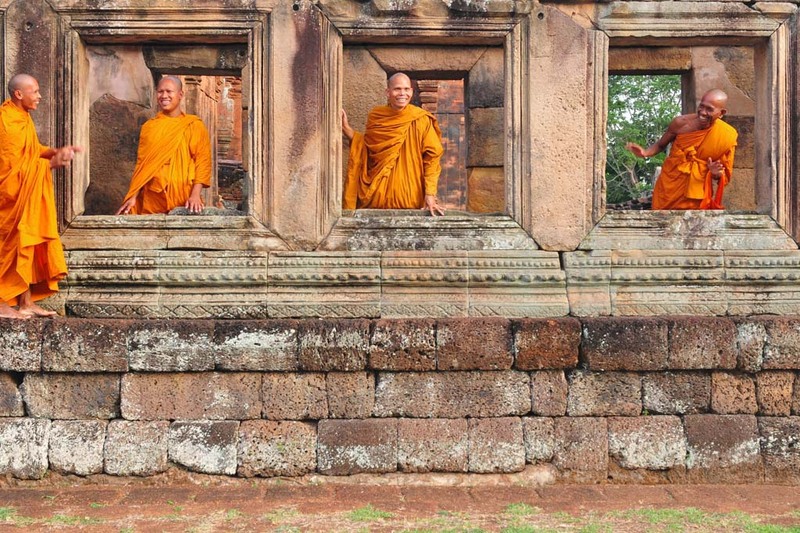 The next on our ruin trail are the 1000-year-old ruins of Phanom Rung and Muang Tam. We stay at P.California Inter Hostel, a guest house run by a lovely family in the village of Nang Rong. It is simple, very clean and the vegetarian meals are very nice. 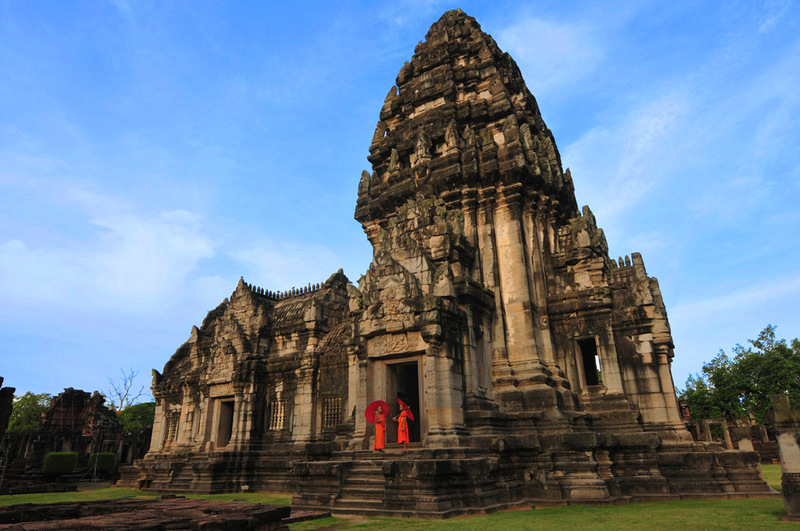 Phanom Rung is a mini version of Angkor Wat and reminds us the most of Angkor. It is in the mountains on top of an extinct volcano with views looking towards Cambodia. Stone-carved stairs start at the foot of the hill and go right to the entrance to the temple at the top. Carved in the shape of a serpent with five heads facing in four directions the stone rails duplicate Angkor Wat’s. Astronomically designed, the 15 doorways into the temple are aligned to the sun’s path. Before and after the equinox, the sunrise and sunsets glow through the doorways. This phenomenon happens four times a year around March and October – two sunrises and two sunsets. Down the mountain, eight kilometres away is Muang Tam. Though the setting is less scenic and not as prestigious as Phanom Rung, it is exquisitely preserved and perhaps the most intact ruins in Thailand. The Buddhist and Hindu motifs carved into the stone are bold and intricate especially when dusk sets off the colours in the pink sandstone bricks, accentuating the hues of rose, red and gold. Monks from the local monastery chant here during our visit and to top it all off, we have this all to ourselves! If you have the time, are visiting the area, or have an interest in ancient history or archaeology, these ruins in Thailand are well worth seeing. A visit to this is area is perfect as a side trip or just to get off the beaten path in Thailand. To see it during one of the festivals or sound and light shows make it all the more worthwhile because of the culture, festivities, and the merriment atmosphere. 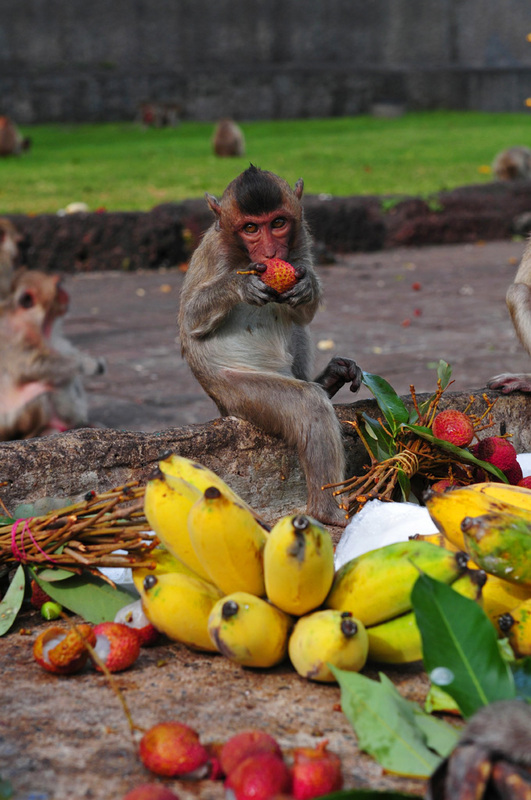 The locals regularly put on a feast for the monkeys in Lopburi. We arrived in Bangkok and then travelled to Sukhothai with Bangkok Airways. The prices of the tickets vary but we paid about 2300 Baht. The Sukhothai airport is 40 kilometres from the Old City of Sukhothai and there is only the airport’s official minibus for transportation. The cost of the minibus transfer is 300 Baht. There is a choice of staying in the Sukhothai New City which is about 12 kilometres from the ruins or the Old City, directly at the ruins. The bus station on the main street near the 7-Eleven has regular departures to Chiang Mai 5.30 hours, Lam Pang 4 hours, Ayutthaya 5 hours and Bangkok 6 hours. We took the morning bus that leaves at 8.20 am and arrives in Ayutthaya 2.00 pm then a taxi from the bus stop to Baan Tye Wang. The Old City is on an ‘island’ surrounded by a moat – three rivers. Bann Tye Wang is in the Old City so it’s in a great location to the ruins. From Ayutthaya station, trains depart for Lopburi every couple of hours. The ruins in Lopburi are only a few minutes from the train station. From Lopburi to Phimai by train, it is necessary to travel via Ayutthaya. Trains don’t go all the way to Phimai. From Ayutthaya to Nakhon Ratchasima (Khorat) the train takes about 3 hours. Trains depart about every 2 hours from 7 am to midnight from Ayutthaya. Once we arrived at the Khorat train station we got a tuk-tuk to the Khorat bus station. From terminal 2 we caught the local bus to Phimai which takes about 90 minutes and cost about 50 baht. From Phimai to Nang Rong we got a taxi which cost about 500 Baht and took about 90 minutes. There is no public transport between Phimai and Nang Rong. It is necessary to go back to Khorat for a public bus to Nang Rong. There is not a lot of tourism infrastructure in Nang Rong and Phimai, therefore accommodation and food are basic. Our accommodation at P.California Inter Hostel with breakfast and dinner is about 500 Baht a night. Motorbike hire and tours to the ruins are available here. Wicha the owner is most helpful and can advise on all transport options in and out of Nang Rong. Transport to Phimai can also be arranged from here. Bus and trains are often late so check you have the right bus! We spend a couple of days at Sukhothai and Ayutthaya but find one day enough at the lesser known smaller ruins. Because the Lopburi ruins are not extensive and it is mainly the attraction of the macaque monkeys, we find one day here plenty. Satchanalai ruins, 70 kilometres out of Sukhothai are other interesting ruins to visit. A tour is about 1500 Baht for 5-6 hours. There is also a bus from the New City that leaves three times a day. When searching online for buses, sometimes Ayutthaya doesn’t come up as a destination. For example, Sukhothai to Ayutthaya won’t show as it’s classed as a stop between Sukhothai to Bangkok. You may also have to remind the bus driver to stop! 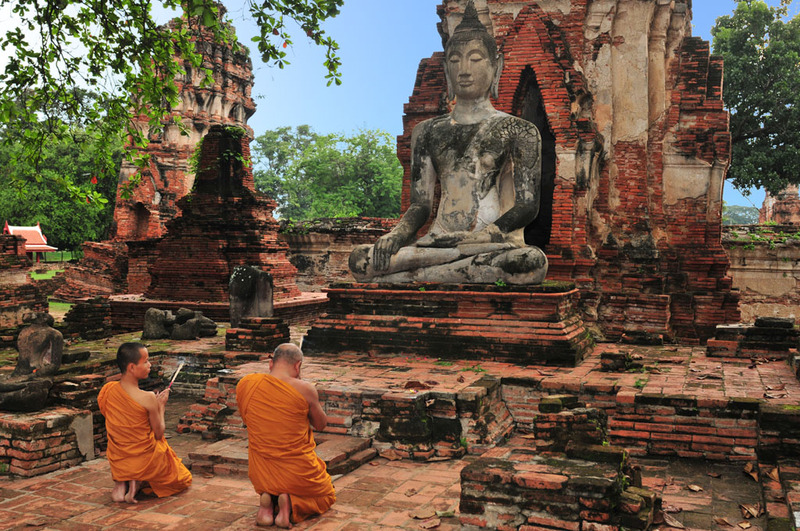 There are many possibilities for different itineraries to visit the ruins in Thailand. Ours is just an example as there are many options of doing these ruins and others in the area. Train and bus travel in Thailand is cheap, comfortable, frequent and safe. Our bus from Sukhothai to Ayutthaya was quite luxurious. It had aircon, comfortable seats, clean toilets and an assistant gives out bottled water and snacks. Another alternative if you are travelling to Chiang Mai from Bangkok is to take the ‘ruins and monkey route’. The train stops at Ayutthaya, Lopburi and Phitsanulok from which you can get the bus to Old City Sukhothai for 50 Baht. These trains depart from Hua Lamphong station in Bangkok and start as low as 300 Baht to 1400 Baht for first class. Looks like a nice album. Keep up the good work! Thanks Jo. It was an excellent trip & we recommend it to anyone interested in the history and culture of the Khmer ruins. We love reading your blogs! It gives us a real taste of the people and culture. Your photos are so beautiful and real we can almost feel like we are actually there. Love your work! Hi Sam. We hope we have inspired you to plan your own trip to visit these magnificent ruins. Thanks for visiting our site. Thank you so much for your suggestions and excellent photos. We shall follow most of your itinerary and tips this January. Thanks Amy. It is a trip well worth doing. Any questions please don’t hesitate to drop us a line. Hi Richard. The Khmer Empire is very interesting and to see the ruins was really fascinating to us. 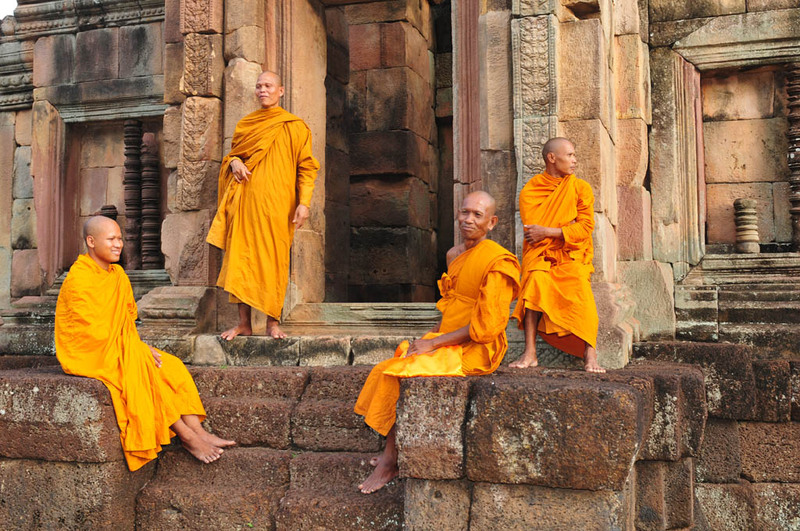 The ruins in Thailand offer a great off the beaten path experience at an affordable price. If you plan on visiting and have any questions please don’t hesitate to get in touch with us. Thanks for your comment, we appreciate it very much. Wow =D. That is some cool stuff there. Some fantastic photography of these ruins and it seems like you managed to see a very good selection of them. If you’re going to repeat the trip, I’d also recommend Muang Sing outside of Kanchanaburi for its amazing surround landscapes and its very out of place location. Or, for something non-Khmer, Khu Bua in Ratchaburi built large platform stupas by the Dvarawati people. One small detail – most of the temples you photographed at Ayuttaya and Sukhothai are Thai architecture and not Khmer. 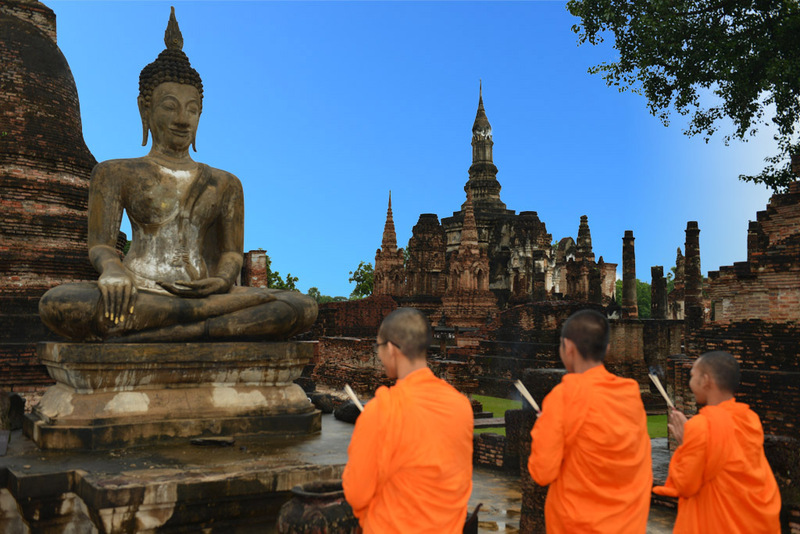 Sukhothai and most of Thailand was indeed a tributary or satellite kingdom of the Khmers. 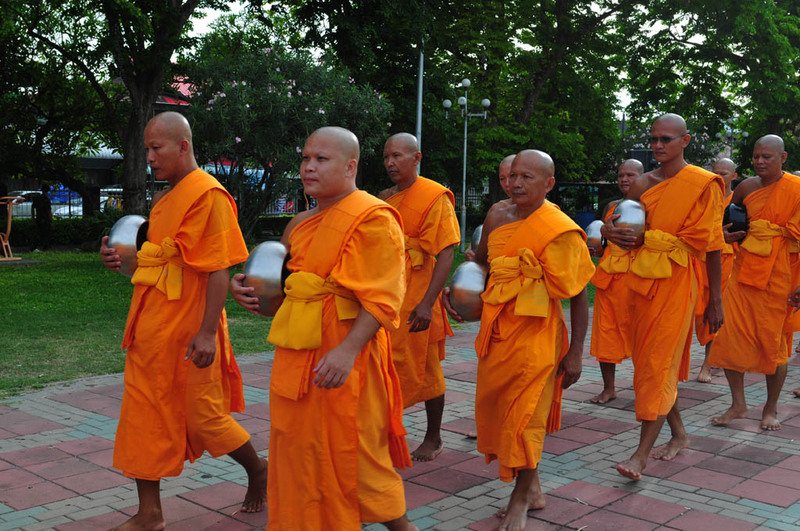 However, the Thais adapted the Prang differently when they broke from of the Khmers. Khmer architecture utilizes large, heavy building stones and their prangs were buildings you could enter. 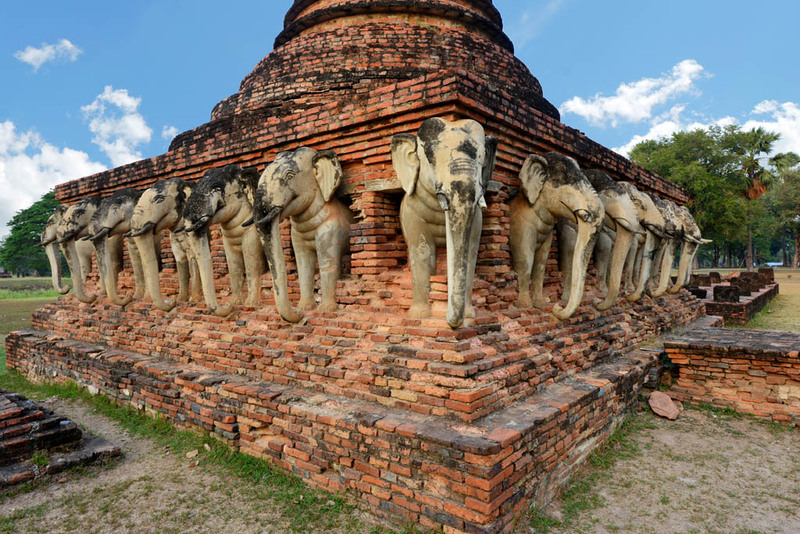 Thai monuments usually were made from small bricks and their prangs were thin, corncob shapes, often with an indent or false door to place an image. They constructed hall around these stupas in order to conduct their ceremonies, unlike the open sanctuaries of the Khmers. I look forward to exploring your site more! 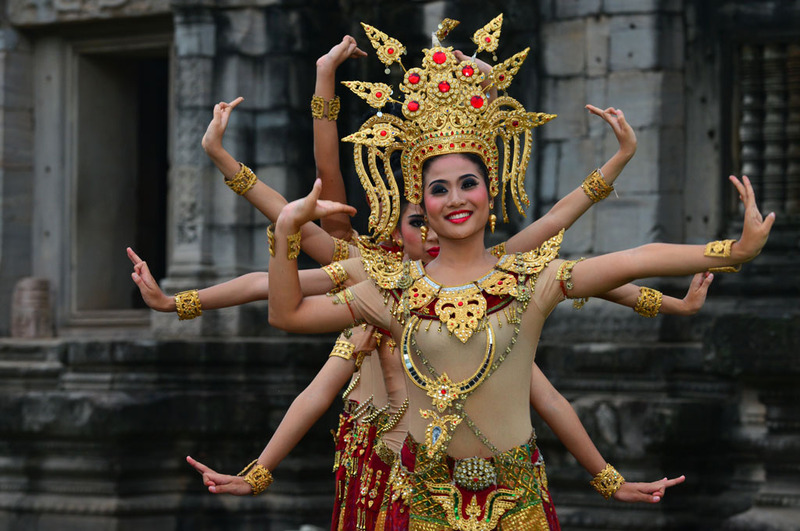 Thanks so much for your interesting information regarding the Khmer and Thai architecture. Looking back we can see what you mean by the difference in design, size and openness. Your article on the Muang Sing ruins (which we hadn’t even heard of before) is great. We also like the look of the cute accommodation on the river. We loved our time visiting the ruins in Thailand and hope to go back and explore more in the future, so this will definitely be on our list!